In the past week Sydney has been fortunate to be visited by the cruise liners Queen Elizabeth III and Queen Mary for just 24 hours. 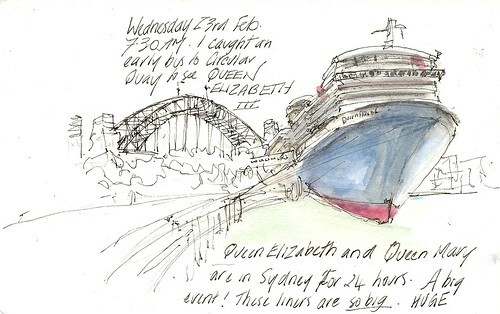 I caught a bus to Circular Quay and drew the QEIII before work one morning, with the Harbour Bridge in the background. It is a huge, grand liner! To the right (out of frame) is the Opera House . What a scene !! !